Warmer weather and fewer crowds make early spring a great time to visit Canada. There's still some chill in the air, but with the snow gone and spring flowers in bloom, May is, for many, an ideal time to visit. The complete gamut of summer activities is not in full swing, but golfing has begun in the western provinces, and spring ski deals are still available. You can go hiking and even camping if you're fully prepared. 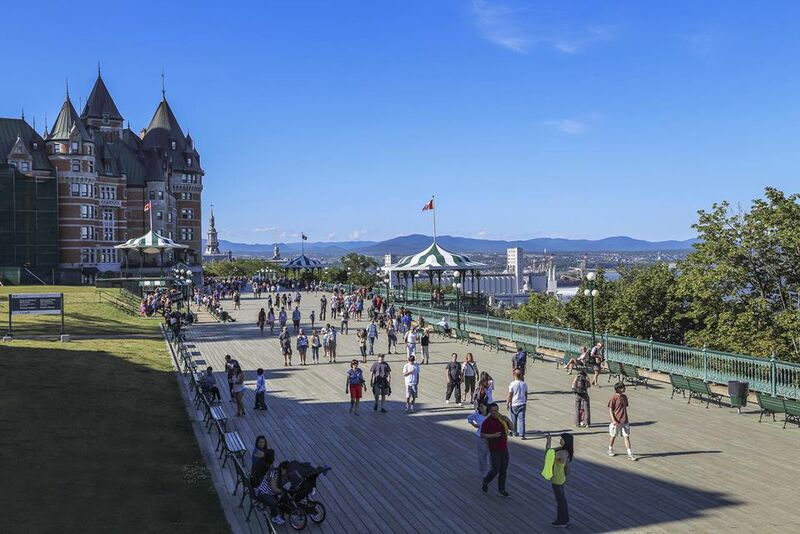 If your eye is on an urban adventure in a Canadian city, May offers pleasant temperatures for walking in its scenic old towns and exciting urban landscapes. But rain is a reality all across the country, so it's smart to have some indoor backup plans wherever you are, along with good waterproof clothing. On the downside, some of the most popular Canadian festivals and events are not yet underway, and May can still be quite chilly and not comfortably warm enough to do certain activities. Certainly, lake and ocean swimming are not yet in season—it's best to save those activities for the summer. Canada is a large and geologically varied country, and weather conditions among Canadian cities can be drastically different. For example, May in Vancouver is much rainier than in, say, Toronto or Halifax. (In general, the West Coast of Canada is milder but wetter than the East Coast.) That said, May can be a bit of a rainy month across all of Canada. Your packing list will vary depending on where you're going, but in general, you'll want to layer up. Bring warm sweaters and a light winter coat to keep warm, but don't be afraid to pack short sleeve shirts to wear underneath, in case you get a beautifully warm spring day. If you're in a city, closed-toe footwear like boots or sneakers is appropriate. If you're heading out into nature, pack sturdy hikers, as the thaw may make trails a little muddy. Plus, it might be rainy in Canada in May—rain boots, an umbrella, and a raincoat all should be packed in your bag. In May, there are a few festivals across Canada that are worth building your itinerary around. The Canadian Tulip Festival: More than 650,000 visitors take in the million tulips on display in Ottawa. May 10–20, 2019. Scotiabank CONTACT Photography Festival: Head to Toronto's Ryerson Image Centre for the world's largest annual photography event. There are over 200 exhibitions of works by photographers from across the globe. May 1–31, 2019. The Stratford Festival: This months-long theater festival runs from April to October in Stratford, Ontario. Catch a number of Shakespeare plays this season, plus Billy Elliott, The Crucible, Little Shop of Horrors, and more. The Shaw Festival: This festival will see 13 plays run on three stages from April to October in Niagara-on-the-Lake, Ontario, the heart of the province's wine country. Carassauga Festival: Carassauga is Mississauga's festival of cultures, celebrating groups from 32 countries. There will be nearly 5,000 performers in nearly 950 performances over the long weekend of events. May 24–26, 2019. Canadian Music Week: More than 1,000 artists will perform over the course of this festival and conference in Toronto. May 6–12, 2019. Victoria Day is a national holiday in Canada that falls on the Monday before May 25th. In 2019, it is on May 20. Government services, schools, and banks will be closed. Victoria Day's long weekend is a big travel holiday in Canada that's commonly referred to as "May Two-Four Weekend" even if it does not fall precisely on May 24. Expect crowded highways on the Friday and Monday of this weekend and long lineups at border crossings. May is generally shoulder season, and you can probably score a pretty good deal on airfare and hotels relative to summertime prices. Book a trip for the second half of May for warmer weather.